American motherhood has changed in many ways since Mother’s Day was first celebrated more than 100 years ago. 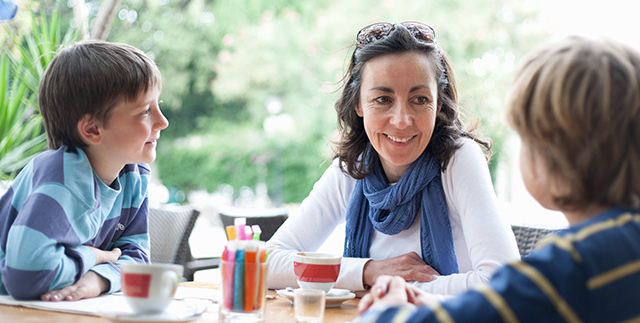 Today’s moms are more educated than ever before. A majority of women with a young child are in the labor force, and more mothers are serving as their family’s sole or primary “breadwinner.” At the same time, the share of women who are stay-at-home moms has increased in recent years. 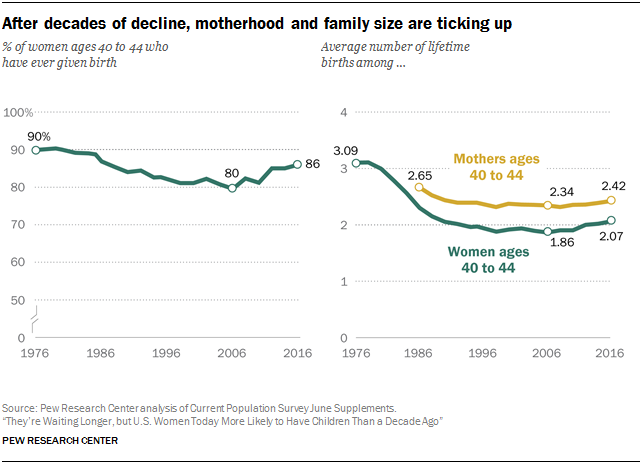 1Women are more likely now to become mothers than they were a decade ago. The share of U.S. women at the end of their childbearing years (ages 40 to 44) who had ever given birth in 2016 was 86%, up from 80% in 2006. This was similar to the share who were mothers in the early 1990s. 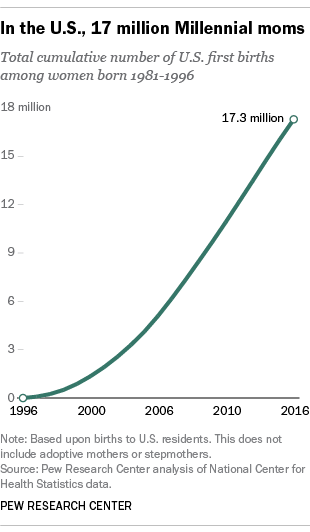 The number of babies a woman has in her lifetime has also ticked up over the past decade, to 2.07 on average in 2016, from a low of 1.86 in 2006. While these findings may seem to contradict the notion that the U.S. is experiencing a post-recession “Baby Bust,” the figures used here are based on measures of lifetime fertility, or the number of births a woman has ever had, while indicators showing a post-recession fertility slump are based on births in a given year. Over the past 20 years, highly educated women have experienced particularly dramatic increases in motherhood. In 2014, 80% of women ages 40 to 44 with a Ph.D. or professional degree had given birth, compared with 65% in 1994. The shares of women who were mothers also rose among those with bachelor’s or master’s degrees during this period, while rates of motherhood remained steady for women with less than a bachelor’s degree, at 88%. Seven-in-ten moms with kids younger than 18 were in the labor force in 2015, up from 47% in 1975. In fact, mothers are the primary breadwinners in four-in-ten U.S. families. In nearly half (46%) of households with a mother and father, both parents are employed full time, up from 31% in 1970. Working mothers (60%) are somewhat more likely than fathers (52%) to say balancing work and family is difficult. While a majority of parents from dual, full-time working households say certain household responsibilities are shared equally, about half (54%) say the mother does more when it comes to managing children’s schedules and activities. 3 About one-in-four mothers are raising their children on their own. While most U.S. mothers are married (68%), a sizable minority (24%) are solo moms. All told, about 9 million mothers are living with a child younger than 18, without a spouse or partner. Solo motherhood is particularly common among black mothers, 56% of whom fall into this category. The same is true of 26% of Hispanic moms, 17% of white moms and 9% of Asian moms. Solo parenthood is far less common among fathers – 7% of dads are raising a child without a spouse or partner in the home, according to a recently released Pew Research Center report. A relatively small but growing share of moms are living with an unmarried partner. In 1997, 4% of mothers were cohabiting, and by 2017 that share had doubled to 8%. While solo parents – moms in particular – have high rates of poverty (30% for moms, 17% for dads), they also tend to be older and better educated than cohabiting parents, and are more likely to be living with one of their own parents. 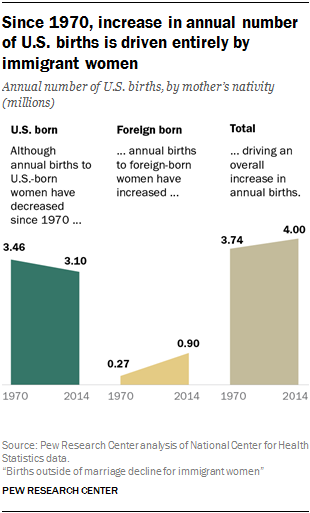 4 Foreign-born moms account for a rising share of U.S. births. While annual births have decreased among U.S.-born women since 1970, they have increased among the foreign born, driven both by a growing foreign-born population in the U.S. and by relatively high birthrates among that group. In 2014, there were 58.3 births per 1,000 U.S.-born women ages 15 to 44; by contrast, there were 84.2 births per 1,000 foreign-born women in this age group. While 14% of the U.S. population was foreign born in 2014, about a quarter of all U.S. newborns had foreign-born mothers. In the past quarter-century, foreign-born moms have boosted fertility not only at the national level, but in 48 states. Foreign-born mothers are less likely than U.S.-born mothers to be unmarried. A third of all births to foreign-born mothers were to unmarried women in 2014, compared with 42% for U.S.-born women. Yet births outside of marriage vary dramatically among the foreign born, depending on their country of origin. Just 1% of new mothers from India, for example, are unmarried. On the other hand, roughly two-thirds of births to women from Honduras (66%) are to unmarried mothers. 5 About half say moms do a better job than dads caring for a new baby. A majority of Americans (64%) say that men and women have different approaches to parenting, though they are split on whether these differences are mostly due to biology or societal expectations. More than half of those who say there is a gender difference in parenting say this difference is a good thing (56%). Most Americans (71%) say it’s important for new babies to have equal time to bond with their mother and their father. At the same time, a somewhat larger share of Americans think that, aside from breast-feeding, mothers do a better job caring for a new baby than say both mothers and fathers would do about an equally good job (53% vs. 45%); only 1% say fathers would do a better job than mothers. When it comes to young children, most Americans say the ideal situation for those in a household with both a mother and a father is for one parent to work full time and one parent to work part time (36%) or not work outside the home (44%). Among these respondents, about four-in-ten (39%) say the mother should be the one who works part time or doesn’t work outside the home, while 5% point to the father. The largest share (56%) says it doesn’t matter which parent stays home. 6 Most say that women face a lot of pressure to be involved mothers. 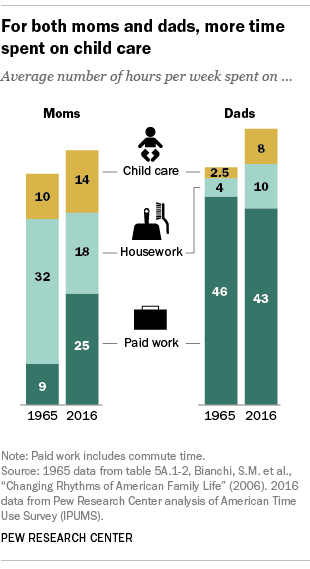 Even in an era where women make up nearly half the U.S. workforce and men are more involved in housework and child care than in the past, the public sees vastly different pressure points for women and men in today’s society. 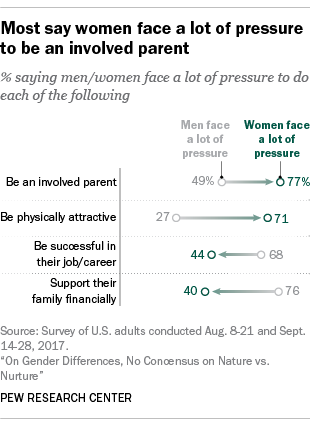 Roughly eight-in-ten adults (77%) say women face a lot of pressure to be an involved parent; a significantly smaller share (56%) says the same about men. In contrast, most adults (76%) say men face a lot of pressure to support their family financially, while only 40% say women face this same type of pressure. About half of mothers (53%) say they spend about the right amount of time with their children. An additional 12% say they spend too much time with their children, and 35% say they spend too little time. (This figure rises to 43% among moms with full-time jobs.) For their part, dads are more likely than moms to say they spend too little time with their children – 63% say this, while 36% say they spend about the right amount of time with their children. The vast majority of mothers (and fathers) say being a parent is very or extremely important to their identity. About nine-in-ten moms with children younger than 18 also say being a parent is both rewarding and enjoyable at least most of the time. Yet mothers’ experiences with parenting vary by how old their children are. Moms whose oldest child is age 5 or younger are more likely than moms whose youngest child is ages 13 to 17 to say parenting is enjoyable all of the time (54% versus 41%). 7 Most babies are now born to Millennial moms. Millennial women (those born from 1981 to 1996) accounted for 82% of U.S. births in 2016. The number of Millennial moms has grown rapidly in recent years and reached more than 17 million in 2016. Although Millennial women now account for the vast majority of annual U.S. births, like many women they appear to be waiting longer than prior generations to become parents. About half of Millennial women (48%) were moms in 2016. When women from Generation X (those born between 1965 and 1980) were in the same age range, by contrast, 57% were already moms. Note: This is an update of a post originally published May 11, 2017.